Martin Grelle, b. 1954, Clifton, Texas, (United States) Born & raised in Clifton, Texas, Martin Grelle and his wife, Joyce, still live on a small ranch a few miles from town. His studio sits in the picturesque Meridian Creek Valley, surrounded by the oak & cedar-covered hills of Bosque County, just a short distance from his home, but also within a few miles of the family & friends who are so important in his life. He has two sons, Josh & Jordan, who have left home to pursue their own dreams, but who stay in touch frequently. Grelle’s parents, Ervin & Ella, have both passed from this life, but he still has his brothers, Carl & Marvin, living nearby, as well as his sister, Mary, who lives in Ft. Worth. Joyce’s 3 sons, Zach, Emitt & Carl, and their families are also close, and visit the ranch often. 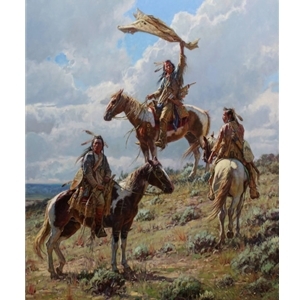 Grelle began drawing & painting when he was very young, and was fortunate to have James Boren & Melvin Warren, two professional artists and members of the prestigious Cowboy Artists of America, move to the area when he was still in high school, and it has had a lasting impact on his direction & career.